Luigi Bosca’s La Linda range represents the pure expression of each varietal. Reds see minimum use of oak, while the whites are aged exclusively in stainless steel resulting in clean, fresh, fruit driven wines. 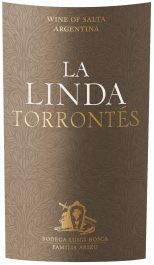 Terroir: Sourced from Bosca’s estate vineyards in north northern region of Cafayate. Vines average 30 years and sit at an extreme elevation of 1700+ meters. Soils here are well drained and primarily sand. Vinification: Grapes are hand harvested and meticulously sorted and destemmed upon arrival at the winery. Grapes are pressed for four hours in a pneumatic press and then macerated in tank for 48 hours. Fermentation and aging takes place at cool temperatures exclusively in stainless steel. Light yellow-green color. Floral aromas with hints of rosehip and a touch of lavender. Sweet entry in the mouth, balanced acidity, and notes of white peach with memories of orange peel jam. Remarkable balance between fruity and flowery taste.